Conventionally, the vertical cable management refers to a solution to secure, bundle and route the cables at both sides of the racks, cabinets, or enclosures. In this management, cable managers can provide a vertical pathway for large numbers of cables from switches to patch panels in the rack system. These vertical cable managers are generally designed in height sizes up to 48U and width size up to 10 inches. The 3” and 5” are the most prevalent width sizes. In addition, the vertical cable managers are often made of metal and plastic. With a range of types of vertical cable management, the most popular vertical cable managers are 5U plastic vertical cable manager with bend radius finger, single D-ring vertical cable manager, and 45U 4.9″ wide plastic vertical cable manager. You can refer to the Figure 1 for these three types as below. In a horizontal cable management, it allows cable managers, placed in front of cabinets or racks, to manage all sorts of cables, like fiber, coax, patch cables, etc. In that way, cables can be well-organized and protected. It is typically one or two rack units high, or even higher if necessary. In the market, the horizontal cable management 1u version is easily found. Altogether, there are three common types of horizontal cable manager: horizontal cable managers with D-Ring, finger duct, or Brush Strip. You can refer to the Figure 2 as below. As a buyer, if you want to choose a proper cable management, it’s a must to know their advantages and benefits of each type. Actually, for cable management, no matter a vertical or horizontal way, they both share similar features. For example, they both greatly improve network performance by enhancing airflow and cooling efficiency and protecting cables from potential damages and dust, like improper bends, movement or sharp edges. Moreover, a neat management will also add aesthetic value to the working place. Besides, the two management ways also bear with their unique traits. By reducing signal interference, the vertical cable management can greatly enhance the network performance. In a vertical cable management, it separates power with data cables within the racks, which greatly lower the chance for crosstalk and interference between them. Additionally, cost reduction will also be the unique trait for vertical cable management. 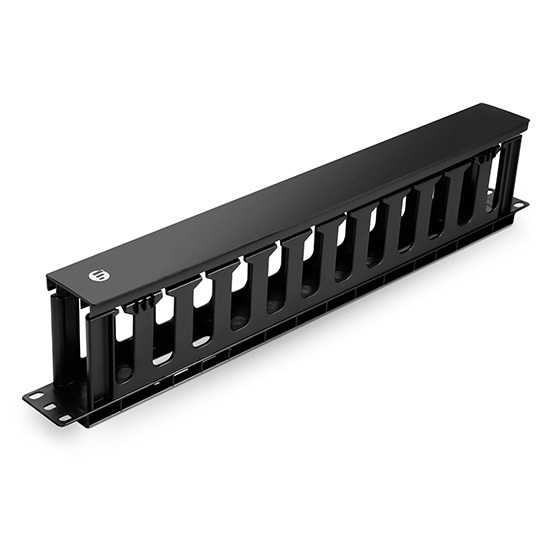 Vertical rack cable management with bend radius fingers is used with angled patch panel directly. In that way, the use of horizontal cable management panels can be reduced, which is a good way to save cost. First, downtime minimized. Using a horizontal cable manager, cables can be settled in an ordered way instead of being tangled with each other. Especially, when something goes wrong, this will make technicians more easily to identify and access where goes wrong and fix it in far less time. Second, growth promoted. By using horizontal cable managers, consolidating devices within racks or adding additional racks without messing up cables will no longer be a tricky task for IT technicians. Since cables are able to be identified easily, tracing what goes where in a move can be much easier at the time when you add new ports and cables. For your better understanding, you can refer to this 1u cable management device at below. Just as the saying, the information makes winners. If you want to be a winner in cable organizing, there are mainly three steps you can follow. First, you need to have a proper planning before installations. Decide the number of cables and connections needed, and where the cables should be routed within the rack. Then you need to have a command of industry standards such as ANSI/TIA and ISO/IEC, as well as any federal, state or local regulations regarding cabling. According to that, you can start to choose your cable organizers. In fact, it’s hard to conclude which type is best when considering their similarities and peculiarities. It depends on actual conditions of your network, such as installing space, cable numbers, and sizes of your rack, etc. Sometimes, you may even find that a combination between vertical cable management and horizontal cable management suits you best. This entry was posted in Cable Management and tagged 1U cable management, horizontal cable management, vertical cable management on September 18, 2018 by Camilla.Zhang.